Haiga (俳画) is the Japanese word for a unique genre of art. A haiga is a style of Japanese painting that incorporates the minimalistic aesthetic of haiku and reflects the content of the haiku that is written within it. The hai (俳) comes from the word haiku, which was previously known in Japan as haikai or hokku. Haiku are 3 line poems that have a 5-7-5 syllable line scheme. Ga(画) in Japanese stands for picture, so the word haiga literally means poem painting. While most non Japanese natives have probably not heard the term haiga, almost everyone has heard the term haiku. Unlike haiga, the haiku has spread across the world as a very respected form of poetry. Since they are seemingly simple to create, children all across the west coast have created at least one haiku in either middle school or high school. While they might not grasp the intricacies and other qualities that haikus possess, they are still doing their best to emulate the ancient Japanese poetic form. Western poets have also tried their hands at haiku and have produced formidable results, demonstrating that the form can be utilized with languages other than Japanese. Haiku spread like wildfire across the nation, but the haiga which emerged with the haiku as an art form in the late 16th century didn’t spread much past the borders of Asia. When examining the difference in success between these two mediums we need to analyze both closely; examining what qualities the haiga instill in the haiku, and what it extracts. The question that this paper will ultimately answer is if the haiga takes away more from the haiku than it lends, and if the painting is just an unnecessary addition to an already perfected art. Another aspect of the haiku that we must not forget to look at is its structure. Instead of having the normal 5-7-5 structure that is standard in haiku, the poem has a 5-9-5 structure. These syllables added to the middle verse that describe the branch make the line sound noticeably longer. He utilizes these extra syllables to instill an added length to the withered branch and paint an image of the crow on the very end of it. As far off from any of the other branches and the trunk of the tree that represent society. When we examine the poem within the context of the haiga, our reading might lose some of it’s possibilities. The painting steers our interpretation in a specific direction which in this case adds to a more complete reading of the work. Another thing to note is that in Japanese there is no differentiation between singular and plural with some nouns. So this poem could also be read as multiple crows perching on multiple branches, which would deviate from our reading significantly. However the painting that the haiku is inscribed on only depicts a single crow on a single branch, and therefore contradicts that reading. When people talk about poetry in general it is always taken as truth that multiple readings are possible, but the haiga in this case contradicts that theory. Would a reading of multiple birds be wrong? I do not think so seeing as Bashō was also known for his wordplay. Addiss however sheds light on Bashō’s view of his haiku: “Bashō had previously written the same poem on a painting of many crows on many branches. To confuse the issue further, even earlier in his career Bashō had painted one crow on one branch with this poem. Unless we want to believe that Bashō kept changing his mind, we must realize that both readings are possible, and that Bashō may have wished that we not be limited to a single interpretation of his poem.” So while the haiga doesn’t strip any readings from the poem, it provides imagery for the reader to utilize in order to fully grasp the depth of the work. Instead of bereaving the work of possibilities, it “enhances the emotional focus” and gives the reader a base for us to base our interpretations. While the haiku seems simple at first there are actually multiple underlying themes that serve to give this poem its depth. The first that Ueda takes note of is it’s allusion to a common image in Japanese poetry. He writes: “The haiku takes as its material one of the cherished subjects of classical Japanese poetry, a country woman pounding cloth on an autumn evening. In ancient times a court noble, traveling through the countryside, would often see a woman pounding cloth on a flat stone and would thereupon write a verse on the loneliness of travel. Parodying this poetic tradition, Bashō wrote a haiku.” While the average reader might not be able to pick up on this allusion, they must feel some absence in the haiku with its lack of a seasonal word or a kigo. Bashō incorporates the theme of the season by referencing a common scene where the season is already depicted. Because we have to slightly remove ourselves from the haiku and think of its content in a different context, a haiga would only pose as a detriment. The haiga limits our imaginations in order to focus on what’s within the text. Another reason why a haiga would hinder the overall beauty of the poem is because of the dual imagery that Bashō creates with his last line. Ueda writes: “The Japanese word for “a robe cat off,” karakoromo, also means “a Chinese style robe,” a garment often worn by ancient court nobles. The elegant picture of a high-ranking nobleman watching a country girl pound a Chinese-style robe to give it a fine finish, recedes into the background. Superimposed on it is the mundane view of an acupuncturist treating an overworked laborer at a disorderly tenement house.” These two different images that are “superimposed” on each other could not be given justice by a haiga. A haiga achieves beauty through simplicity, just as a haiku attributes its beauty to its austerity. Painting something that contained as much depth as the haiku would only distract and deter the reader from its charm. Before analyzing the haiga, Addiss provides a flawless definition of what a haiga should do: “In a fine haiga the poem does not just explain the painting, nor does the painting illustrate the poem. Instead, they add layers of meaning to each other… Haiga is more than the sum of its parts- poem, painting, the combination of the two and whatever further experiences, memories, and images that these may suggest to each viewer. This multiplicity arising from the apparent simplicity is the outstanding characteristic of haiga, making it a unique genre within the world of Japanese art.” This balance between the written and the painted is immaculately achieved. The deer gallops on the scroll from the very edge and plants itself in front of the haiku. The deer gains shape with the progression of the brush stroke and his head points to the sky as if it is about to”cry.” The quick brushstrokes that make up the deers trail resonate with the scrawled calligraphy that describes it. 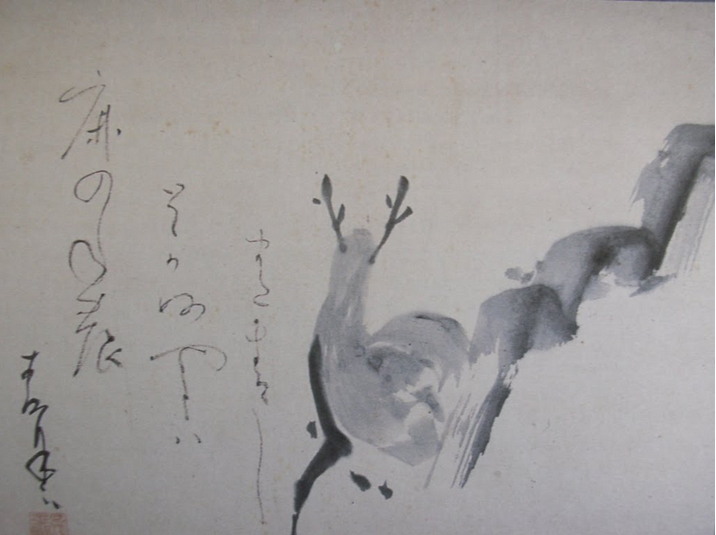 His signature and the deers left leg also parallel each other, Addiss writes: “ Otsuyu’s signature and seal form a closure to the calligraphy, just as the left leg of the deer anchors the painting. The painting, poem and calligraphy all stress natural interconnection- this is the joy of haiga.” Such beauty could not be achieved by either the haiku or the painting by itself. This interconnectivity that provides appeal to both components of the haiga is what make this the best example of a haiga’s artistic potential. While a haiku is an incredible art form on its own, a haiga is able to illuminate facets of the haiku that some readers are unable to see. The painting portion of a haiga cannot stand very well stand alone as a piece of art without the haiku, but in most cases it was never intended to be judged in that manner. In a haiga the haiku and the painting create a perfect symbiosis and the beauty that is achieved through the finished haiga cannot be attributed to either medium. The reason for haiga not becoming popular outside the borders of Japan are still unknown, but maybe it has to do with our desire to separate the haiku and painting and examine them as two different entities. Addiss however has a much darker perception of the West and writes: “Perhaps this is because the qualities of modesty and simplicity that are so admired in haiga have not yet been fully appreciated in the art world of the West.” Either way, we cannot deny the haiga of its unique artistic merit. Addiss, Stephen. Haiga: Takebe Socho and the Haiku-Painting Tradition. Virginia: The Arts, 1995. Print.